This node creates a mask from the heights of a terrain. The mask created has the same size and resolution as the input terrain. To add a Mask from Heights node, right click in the Graph Editor and select Create Node > Mask Generation > Mask from heights. Two modes exist to edit the Mask from heights node. Gradient mode: In this mode, a gradient of values exists, with 0 corresponding to the defined Minimum height and 1 corresponding to the defined Maximum height. At each vertex, the mask has a value of 0 (black color) if the height of the terrain is less than or equal to the minimum height; it has a value of 1 (white color) if the height of the terrain is higher or equal to the maximum height; it has a value between 0 and 1 if the height of the terrain lies between these two heights. Manual: The range is set manually. Automatic: The range is set automatically according to the terrain. The minimum height of the terrain gives the mask a value of 0 (black color), and the maximum height of the terrain gives the mask a value of 1 (white color). Select mode: At each vertex, the mask has a value of 1 (white color) if the height of the terrain is between the Maximum height and the Minimum height; otherwise, the mask is set to 0 (black color). The range is set manually. Gradient mode The mask has a gradient with values between 0 for the minimum height up to 1 for the maximum height. Select mode The mask is set to 1 for heights between the minimum height and maximum height; otherwise it is set to 0. 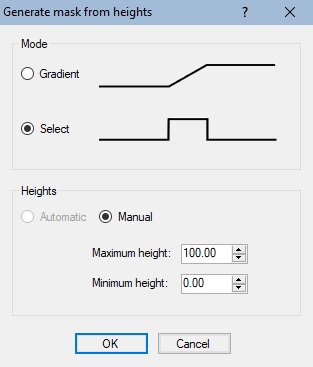 Automatic mode The input terrain defines the minimum height and the maximum height. Manual mode The minimum height and the maximum height are set manually. Maximum height The maximum height of the terrain. Minimum height The minimum height of the terrain.